Here at CA House, we believe that we are at our best when we are engaged in our communities, sharing our passions, skills and talents with one another. 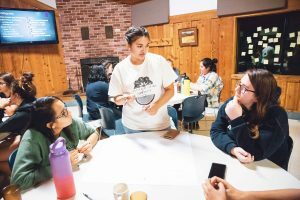 This year, we will be expanding our Student Leadership offerings as an opportunity for more students to empower their fellow community members to engage in opportunities related to our four basic values: faith, community, social justice, and sustainability. Returning Residents are strongly encouraged to apply. As a Community Advisor (CA), you will have the opportunity to work alongside CA House professional staff and five other CA’s to develop a deeper community through programming and one-on-one relationship development with your peers. The CA House Community Advisors serve as the primary point of contact between residents and staff by building relationships with the members of their house to ensure that all members of our community are integrated into the CA House program and mission. You are skilled at forming relationships and building community. 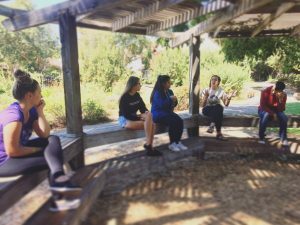 Work alongside CA House Campus Minster, Community Coordinator, and Community Advisor Team to develop community-wide special programming for the MLC once per quarter. Here at CA House, we aspire to be a community on the forefront of engaging with daily practices of sustainable living. As the Sustainability Coordinator, you will be the primary student engaging with questions of sustainability in our community, setting goals, and taking proactive leadership to make those goals a reality! For its entire history, CA House has taken its commitment to social justice very seriously. In 1963, CA House organized a busload of ministers, faculty, students and community members on a trip to Selma, Alabama for the Martin Luther King Jr. march on the state capitol. During the Vietnam War, CA House was the meeting-place for a collection of Vietnam “war resisters” and supporters, and provided draft counseling to young draft-aged men. In the nineties, CA House was the first Christian organization in Davis to affirm the full inclusion of the LGBTQ+ community in the life and ministry of the Church. Additionally, we believe that serving together is one of the best way to celebrate our shared values in interfaith community. In what form does our commitment to service and justice take today? All Student Leaders will receive the Student Leader Scholarship, a $125 rental reduction each month.